The cast of Speakeasy Stage Company’s “Small Mouth Sounds.” Photo: Nile Scott Studios. BOSTON – Silence may be golden, but it usually isn’t what theater-goers are seeking when they go to the theater. Yes, there can be long, pregnant pauses and stretches without dialogue, but few plays are built with silence being not only prevalent but dominant. It all takes place during a five-day retreat in a rural area led by an unseen character called The Teacher, performed live at each performance by Marianna Bassham in an upstairs booth, from which her pronouncements and bon mots rain down on the participants like the Word of God. She is a mixture of mysticism and New Age philosophies, a combination self-help guru, stern teacher and supportive friend. In short, she is all over the place, and her erratic leadership becomes more unsettling as she begins to lose her grip on the proceedings. The Teacher has commanded silence with few exceptions for the run of the retreat.. As the participants file into the set designed by Cristina Todesco – a simple space with the audience on three sides of the Roberts Studio Theatre – she rattles off long lists of do’s and don’t’s, which are aimed strictly at the group and not herself. Wohl has conjured up an eclectic set of characters. Sam Simahk is Rodney, the yoga instructor and YouTube sensation for whom mediation and the idea of a retreat seems second nature. 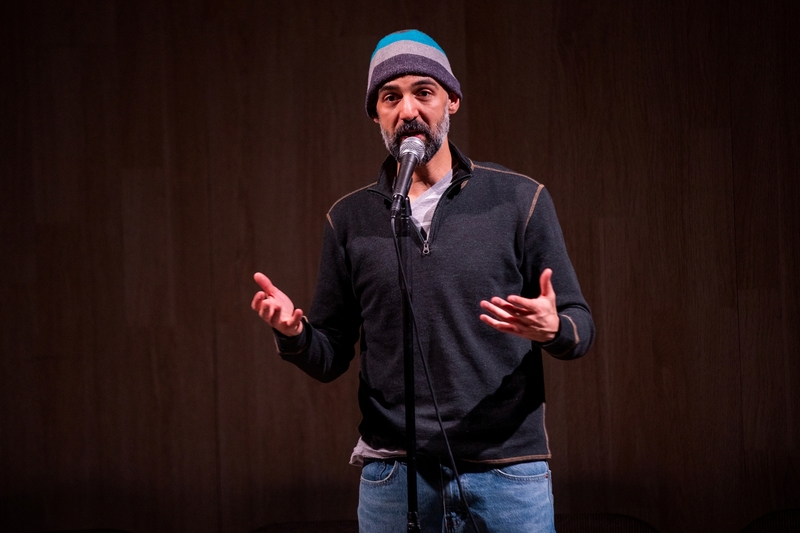 The estimable Nael Nacer, who imbues his character of Ned with a sense of decency and concern for others, even in, in this case, after a Job-like list of disasters that have befallen him, taking him to hell and back, his monologue offering such a tale of woe that it quickly becomes a comic delight – save for his ringing declaration about climate change. Joan (Kerry A. Dowling) and Judy (Celeste Oliva) arrive together, squabbling about whose fault it was that a wrong turn delayed their arrival. The excommunications continue, temporarily despoiling the relationship and opening the door for Judy to share time with Barlow Adamson’s Jan , a grieving father of Nordic heritage whose entire dialogue in the play will become the last say. The last to arrive – well after The Teacher has laid down the series of ground rules that amount to the a giant Stop sign — will be Alicia (Gigi Watson), a self-absorbed young woman who is weighted down with luggage and already violating several rules just by stepping in the door. Director M. Bevin O’Gara, now the producing artistic director at the Kitchen Theatre Company in Ithaca, N.Y., has authored other successes at Speakeasy, such as “Clybourne Park,” “appropriate” and “Tribes” and here she has parlayed adroit casting and her own steady hand at the tiller in delivering Wohl’s work to the Speakeasy audience. 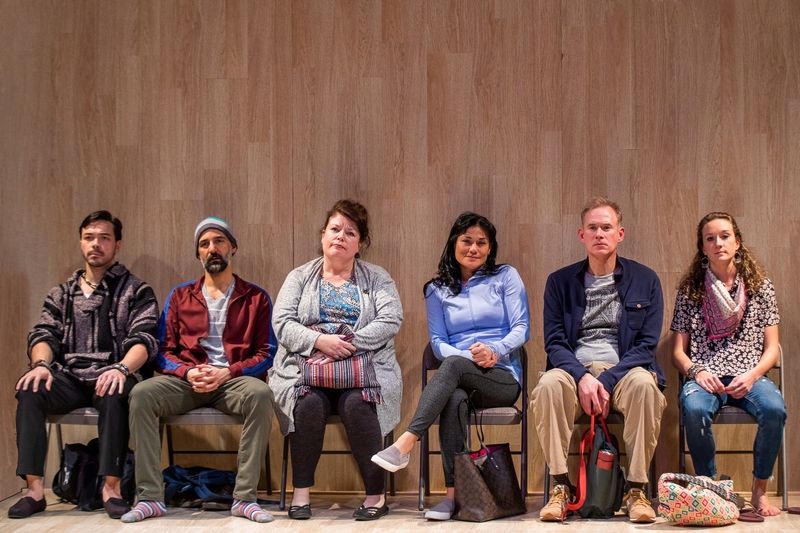 “Small Mouth Sounds” takes the audience out of a comfort zone that extensive and revealing dialogue usually delivers, instead requiring them to listen ever harder and watch ever closer to get a feel for the characters; meanwhile, the characters on stage are doing the same thing. There are “tells”– styles of clothing and fragments of dialogue, for instance — that will enable the audience to try and fill in the missing gaps in the characters during the 105-minute production with no intermission. The silences – often awkward, sometimes endearing and informative – cause us to focus on the unsaid, but perhaps felt. The Speakeasy Stage Company production of Bess Wohl’s “Small Mouth Sounds.” Directed by M. Bevin O’Gara. At the Calderwood Pavilion of the Boston Center for the Arts through Feb. 2. speakeasystage.com.